Specialised Health and Medical Search Engine Since 1992. Middle East Health Network  is a company Registered in the United Kingdom and Jordan owned by a Group of investors both from the Telecommunication and the Health Field. With a specific aim to establish the first fully interactive single electronic database of Health practitioners operating globally on-line. 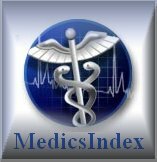 Banners are placed and rotated on the First page of MedicsIndex.com page, along with other Medical/health related advertiser's banners.